Icy Wonders Video Slot Guide & Review - Casino Answers! Icy Wonders is a 5-reel, 30-line video slot developed by Net Entertainment, featuring a wild symbol, scatter wins, multipliers, a free spins feature, a bonus game and a progressive jackpot. You can play the Icy Wonders video slot at Bovada. Coin values on the Icy Wonders slot machine are $0.01, $0.02, $0.05, $0.10 and $0.20. You can select from 1-20 paylines on Icy Wonders. You can select from 1-4 bet levels (or coins). The lowest total bet you can make on the Icy Wonders video slot is a penny per spin up to maximum total bet of $24 per spin. Icy Wonders is designed for casual slots players, although high rollers can enjoy it too. You can manually skill stop the reels by hitting the Spin button in the middle of a spin. 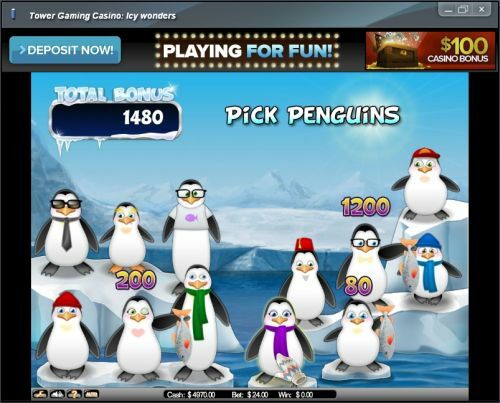 To play Icy Wonders at the highest bet level with all 30 lines selected, hit the “Max Bet” button. For all other wagers, press the Spin button. Icy Wonder’s highest paying symbol is the Fish symbol. If you hit 5 Fish symbols on a selected payline, you will win the 7500 coin top fixed jackpot. The Fish symbol is wild and will substitute for all symbols except for jackpot, scatter and bonus symbols. 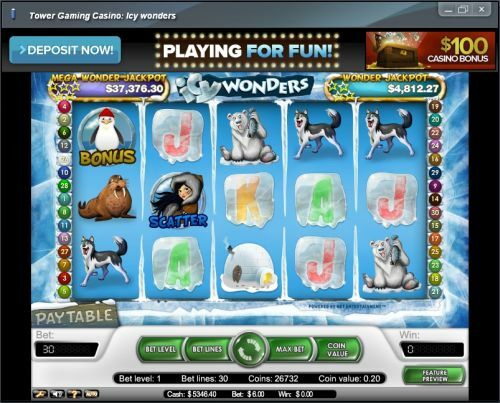 The Eskimo Girl symbol is the scatter symbol on the Icy Wonders online slot. If you hit 2, 3, 4 or 5 Eskimo Girl symbols, you will win 2X, 4X, 50X or 400X your total bet. If you hit 3, 4 or 5 scatter symbols, you will win 10, 20 or 30 free spins with a 2X multiplier. Jackpot, bonus game and additional free spin wins are not affected by the multiplier. The Icy Wonders video slot has not one, but two progressive jackpots. There is the Wonder Jackpot (which is at $4,812 right now) and the Mega Wonder Jackpot ($37,376). The jackpots are won by collecting 4 or 5 star symbols ontop of the regular game symbols. The more you bet on Icy Wonders, the bigger chance you have of winning one of these progressive jackpots! To play for them, you can sign up at Bovada! Winning combinations and payouts are made according to the Paytable. Payline wins are multiplied by the bet per line. The wild symbol will substitute for all symbols except jackpot, scatter, and bonus wins. Scatter symbol pays total bet. Scatter wins are paid independent of bet lines selected. Scatter, free spins feature, bonus and jackpot wins are added to payline wins. Only the highest win per active payline paid. Wins pay if in succession from left to right, except jackpot and scatter symbols. Simultaneous wins on different paylines are added. Icy Wonders has an autoplay mode that can be opened up by hitting the “Auto” button. You can play 10, 25, 50, 75, 100, 250, 500, 750 or 1000 autoplay spins at a time. In the advanced settings, you can set Icy Wonders autoplay mode to stop on any win, if free spins is triggered, if the jackpot is won, if a single win exceeds (any amount you input) and if cash increases/decreases by (any amount you input). You can stop the autoplay mode at anytime on the Icy Wonders slot game. Not only is Icy Wonders wonderfully put together as far as the presentation goes, but it has enough special features to warm you up. It has a bonus game, a free spins feature with a multiplier, two huge progressive jackpots and lots more! If you’re looking for the best casino to play Icy Wonders at, we recommend signing up at Bovada! If I’m in the USA, can I play Icy Wonders for real money? Unfortunately, USA-based players cannot play Icy Wonders for real money. For an arctic-themed video slot Americans can play, please read our Northern Lights Video Slot Review. Where can I play a free Flash game of the Icy Wonders video slot? You can play a Flash version of the Icy Wonders slot game at Bovada. You can play for free or for real money. If you experience any difficulties with the Flash software, make sure you have the latest version of Adobe Flash Player installed on your computer. How do I win the Icy Wonders progressive jackpots? Often, you will see stars come up ontop of other symbols in the game. To win the Wonder Jackpot, you are going to need 4 of these stars to come up on a spin. For the Mega Wonder Jackpot, you will need 5 stars. To increase your chances of winning these jackpots, raise your bet. The more you bet on Icy Wonders, the more your chances are of winning are! Where do you recommend I play the Icy Wonders video slot? We recommend that you play Icy Wonders at Tower Gaming Casino. For more information, please read our Tower Casino Review.